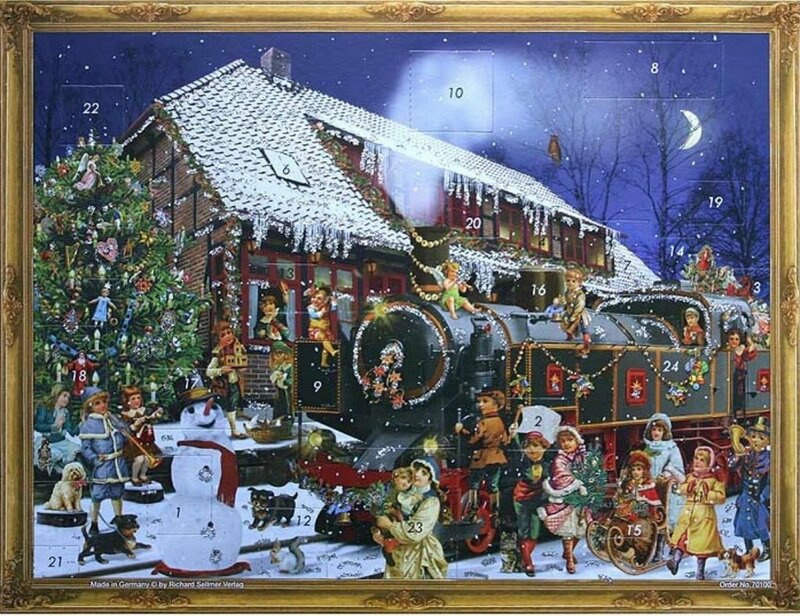 These beautiful advent calendars are imported from Germany. Our Victorian themed pieces are of contemporary design but with a wonderful look back to that period using figures and costumes from the past. 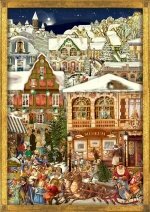 Our photographic advents are all die cut shaped calendars so that the contour of the calendar is the roof line of each building. The quality of the photographs used to make them is very good. 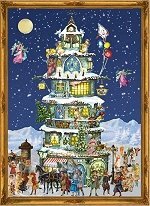 Add to that their large size ( most being 21 inches high ) and the great content of the individual images used behind the 24 little doors of the calendar itself and you have a remarkable piece of art. Westminster Abbey leads the list of my English themed favorite. 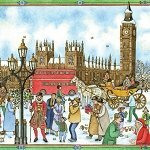 The calendars on this page are just a small sample of all that we carry. 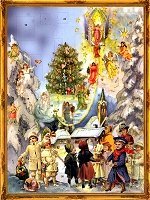 Visit our calendar specific web site - www.Child-Advent-Calendar.com - or click on the photo above to transfer. 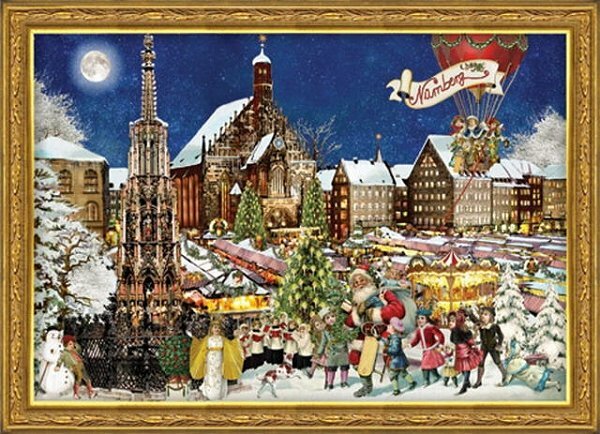 This is a festive downtown plaza in a German town all decorated for Christmas and Father Christmas has arrived in his open coach. The small photo shows a detail of the lower right hand corner. Click the photo to see the full calendar. 18.5 long x 11 high. 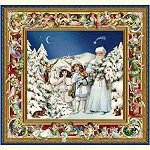 A very festive Father Christmas with two warmly dressed children in a Winter wonderland complete with animals. 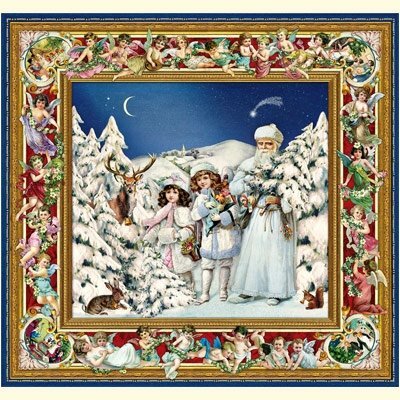 The most striking thing of the entire piece is the remarkable border of Cherubs that make up the border frame. A beautifully detailed calendar and quite large at 19.5 18.5 inches. 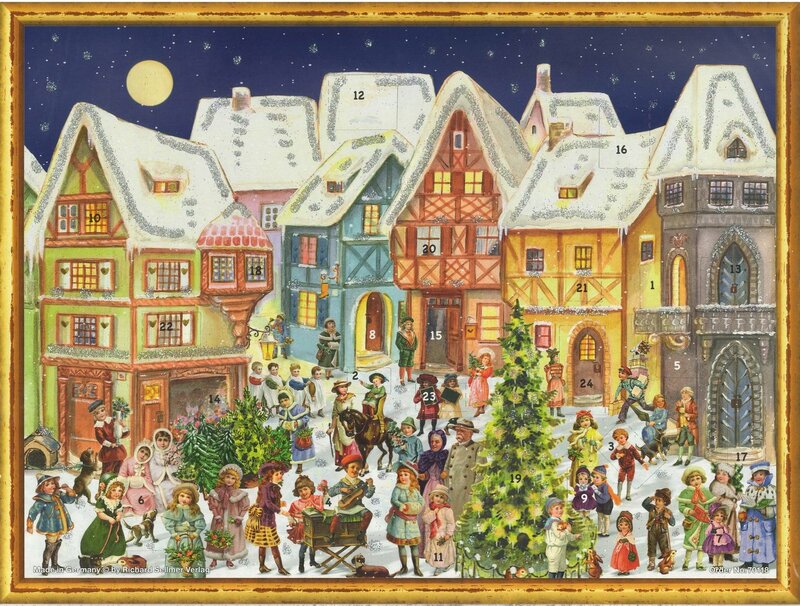 This beautiful advent paper calendar is about 10.5 inches by 14 inches and was manufactured in Germany by the Richard Sellmer Verlag Company. The detailed picture has 24 little doors to open. Each door has a little picture behind it. 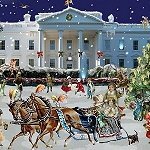 The tradition is to open one door each day from December 1 thru December 24. 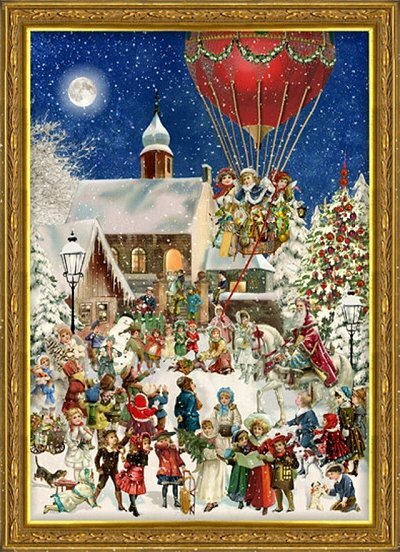 A very busy winter scene where a trio of girls have gotten a balloon ride. 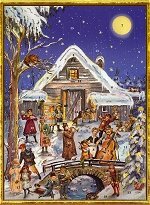 St Nicholas is riding up on his horse amidst a crowd of well dressed children who are braving the snow and enjoying the holidays. 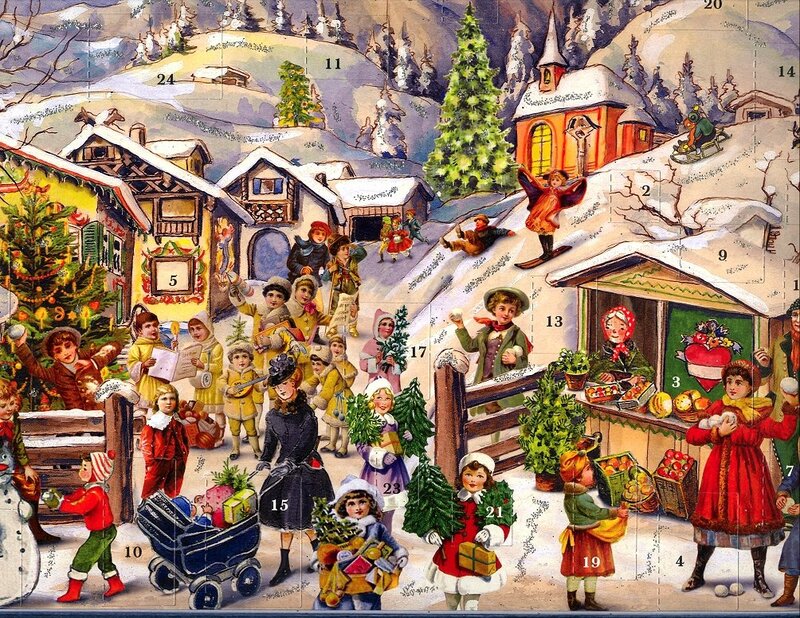 I love these busy advent calendars and so do children who find so many things going on in them. 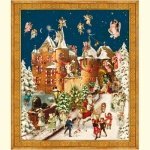 This castle and the townsfolk are making merry indeed. 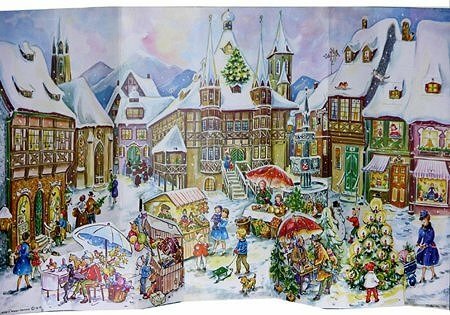 This beautiful advent paper calendar is about 10.5 inches by 14 inches and was manufactured in Germany by the Richard Sellmer Verlag Company. 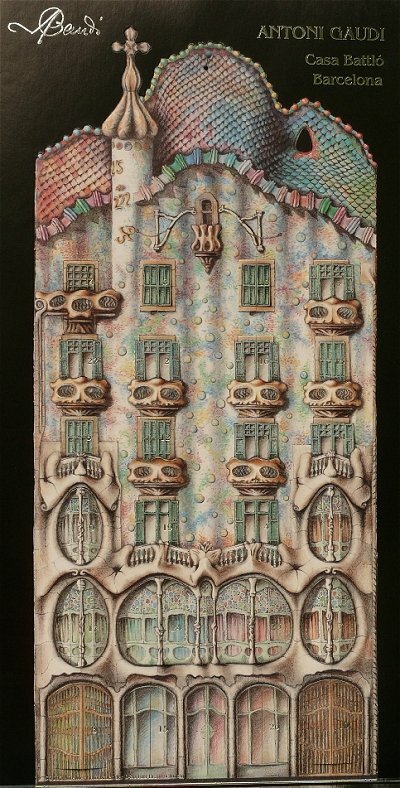 The detailed picture has 24 little doors to open. Each door has a little picture behind it. 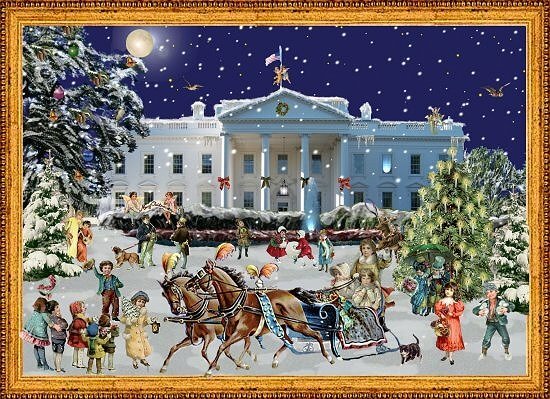 The tradition is to open one door each day from December 1 thru December 24. 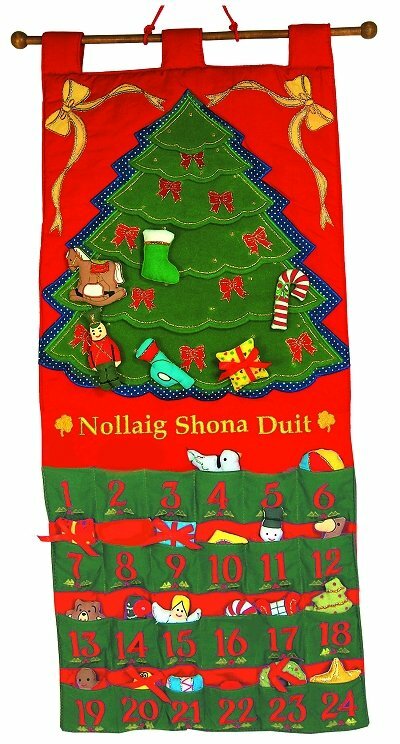 Children love to open a door a day as they count down to Christmas. 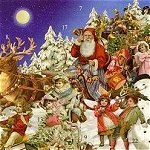 Victorian Children in Sleigh Advent Calendar. 14 inches long x 10 inches high. 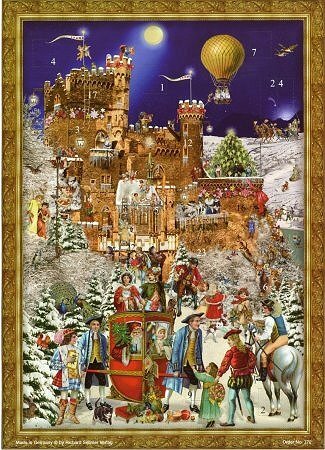 Another fun design by artist Barbara Behr who uses a collage technique to design her festive advent calendars which have a Victorian feel. 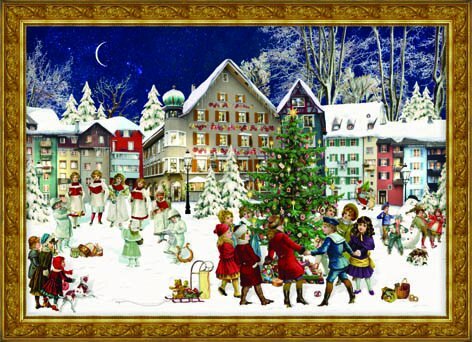 This one features a street scene with children enjoying the festive time of year. 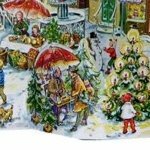 They are building snowmen, bringing home a tree, shopping, and just having fun. 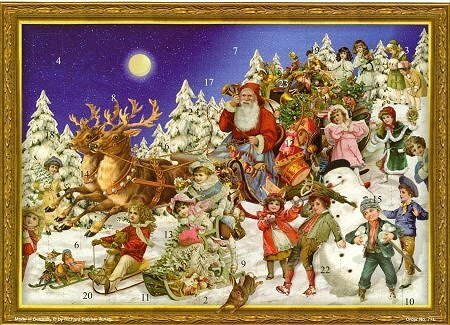 Calendar is quite large at 33 inches long by 11.5 inches high when flat and has folds that allow it to be self standing on any shelf or table. 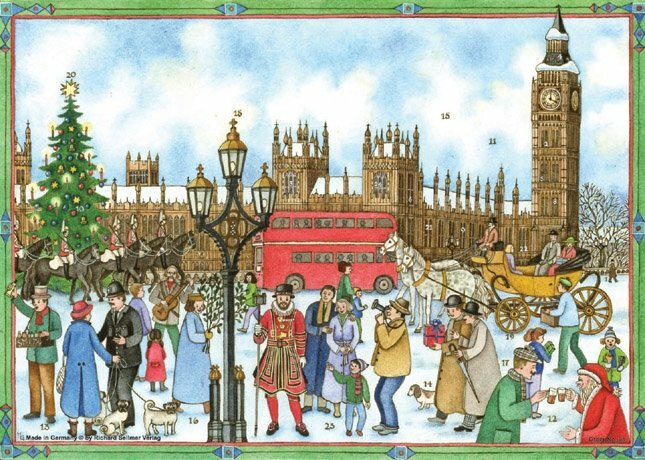 It is also printed on both sides with doors on the one and another similar street scene on the back. 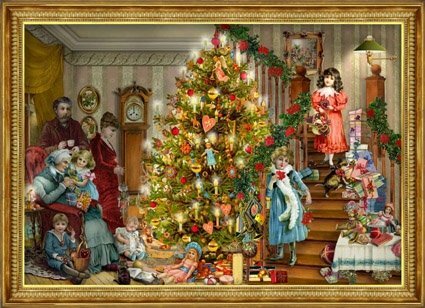 The family is ready to enjoy an overflowing Christmas Tree that glows in this Victorian sitting room. 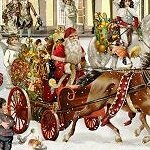 To us he is Santa Clause but then he was Father Christmas and the children can't see him being so happily preoccupied with their tree. I especially like the small dog and cat who are getting involved. They are far better behaved than my own who would have gotten into a great deal more mischief. It is plain without the ribbon in the photo. 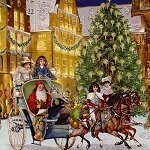 Victorian Santa in Cart Advent Calendar. 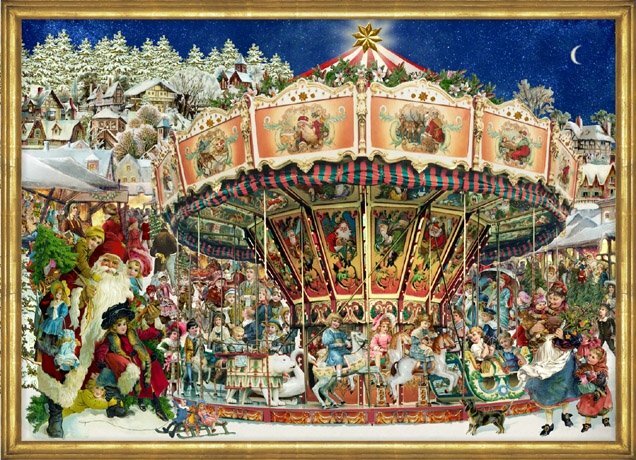 There are 16 or so children playing around Father Christmas as he arrives in his reindeer drawn sleigh. Wonderful childrens costumes and note the startled hare that is actually jumping out of the frame, a nice touch. 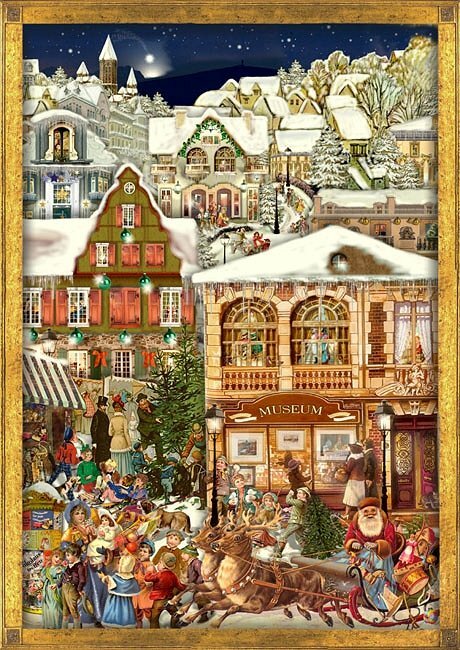 The village is all decked out with the coming of Christmas and everyone is out and about in this Victorian village. 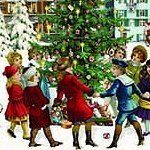 Your child will enjoy seeing all the different activities depicted from picking out a Christmas Tree to Santa arriving in his reindeer drawn sleigh. 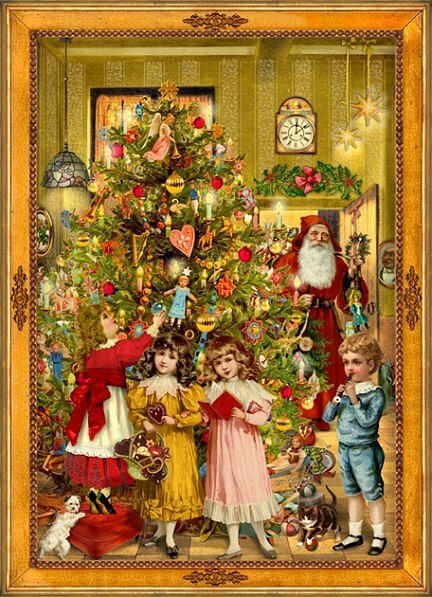 Victorian Village Carolers with Tree Advent Calendar. Size @ 14 inches long x 10.5inches high. There is a smaller version of the same design available below. 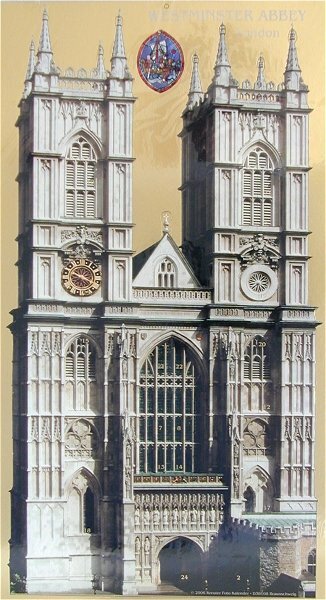 Westminster Abbey in London England is the subject of this beautiful calendar. The front facade is featured with the individual calendar windows being pictures of the stained glass. Die cut so top of calendar follows outline of Abbey. 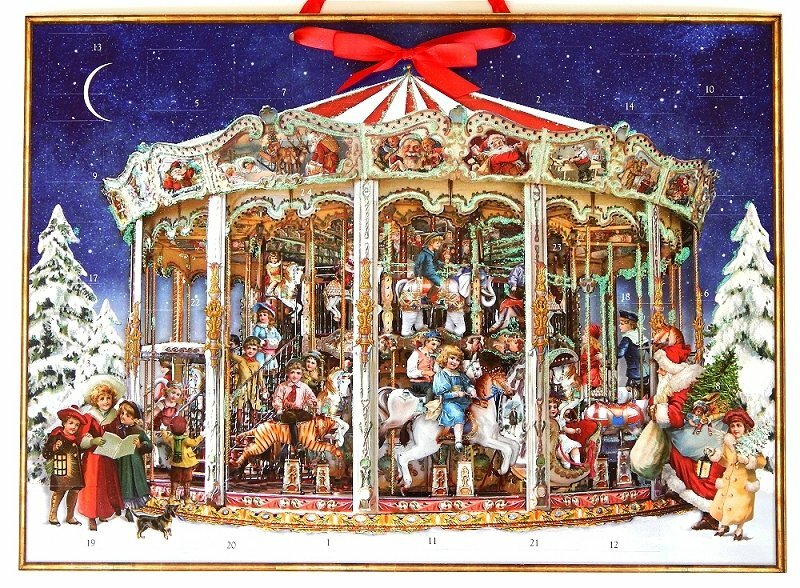 A beautiful calendar that is a true Nativity. The large photo shows a detail of the central scene that is revealed in the 4 doors that open in the center of the piece. 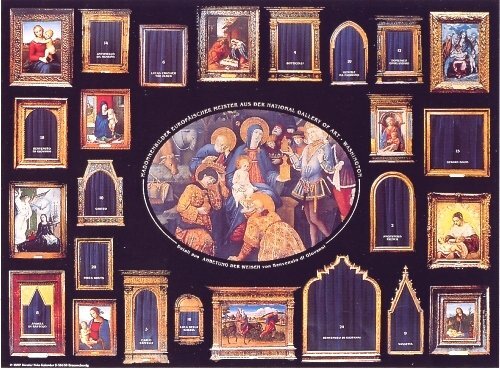 All the other doors have supporting images that are all directed to this central manger scene. 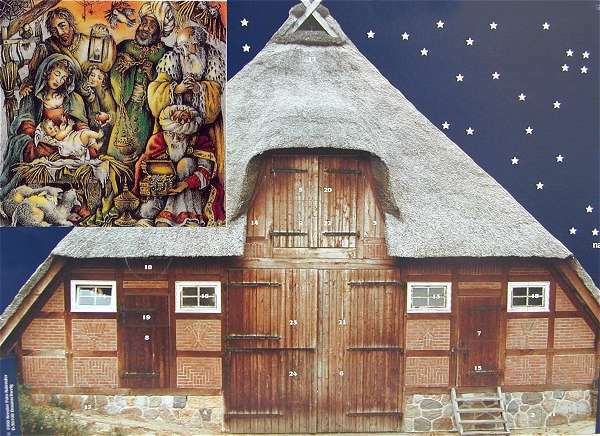 The building is a sheep barn in reality and very appropriate to use for this artists view of the birth of Christ. This marvelous church was built on the spot where Emperor Alexander II was assassinated in March 1881. 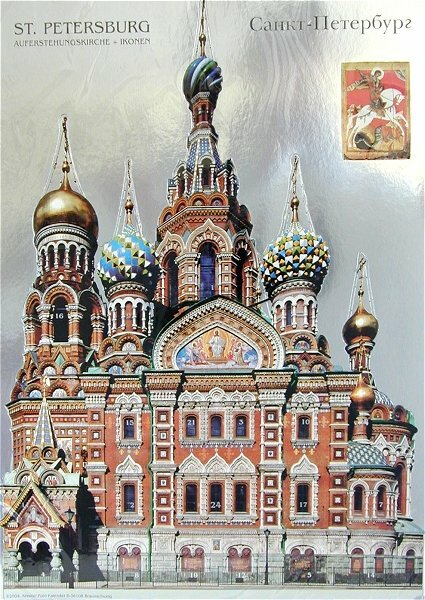 The church was built between 1883 and 1907 and was officially called the Resurrection of Christ Church and was almost entirely funded by the Imperial family and thousands of private donators.The interior and exterior of the church is decorated with incredibly detailed mosaics, designed and created by the most prominent Russian artists of the day. 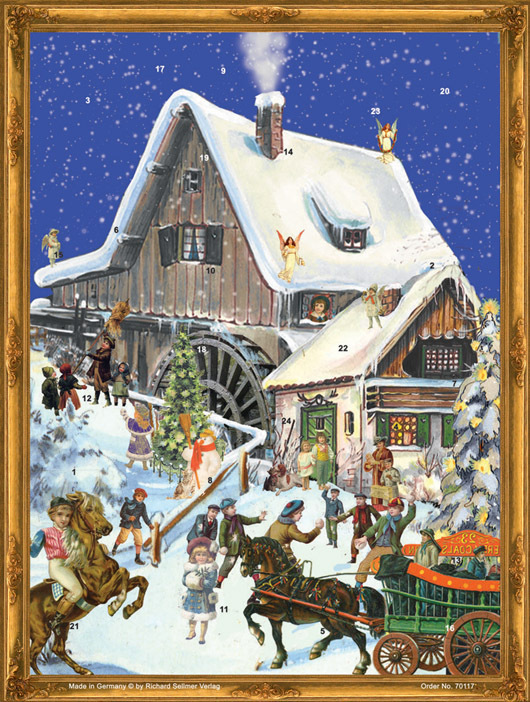 The small calendar windows feature icons from the Russian Museum. Die cut so the church lifts out of the background pictured. 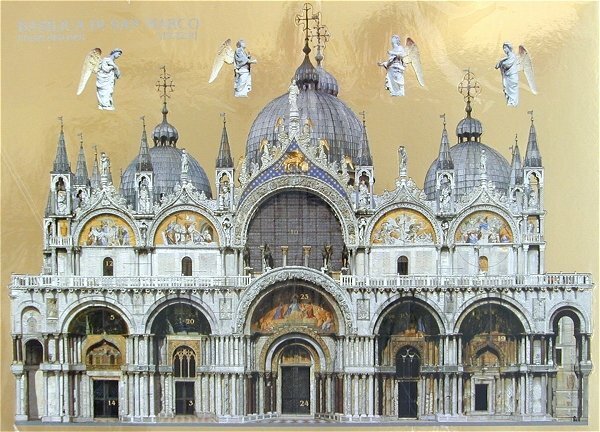 St Marks Basilica , the cathedral of Venice, is the most famous of the city's churches and one of the best known examples of Byzantine architecture. The small calendar windows feature images of angels as represented in paintings and sculpture. 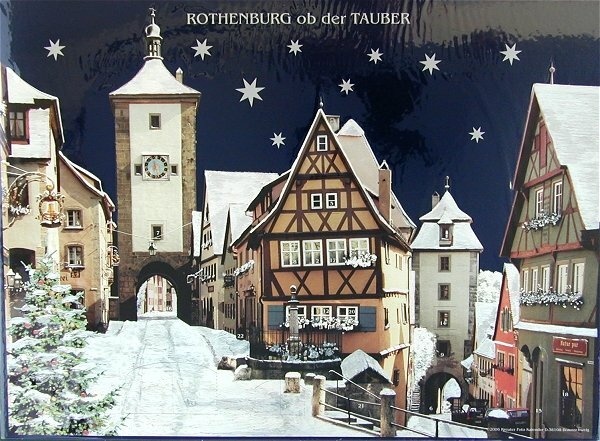 View of the historic famework houses of Rothenburg and the neighboring tower. 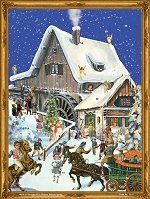 Set in winter with the small calendar window images of Christmas arts and crafts. Die cut so the calendar does not have a night sky as in photo but lifts out of it. 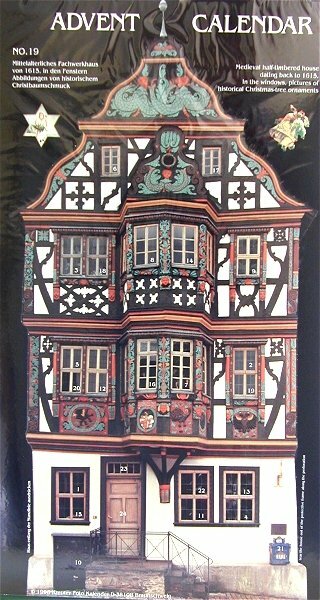 A medieval half timbered house in Idstein Germany. 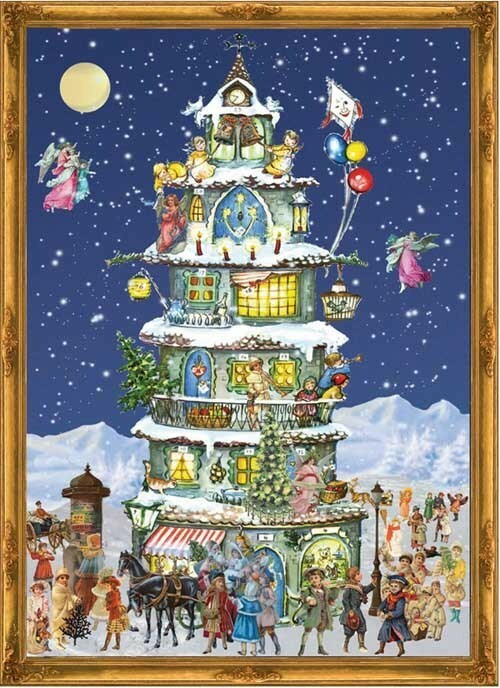 The small calendar windows have pictures of historic Christmas Tree Ornamenaments. This calendar displays European masterpiecs portraying the Virgin Mary and the birth of Christ, framed in gold as exhibited in the National Gallery of Art in Washington D.C. I have scanned an image with some of the windows open to give you a better sense of the piece. 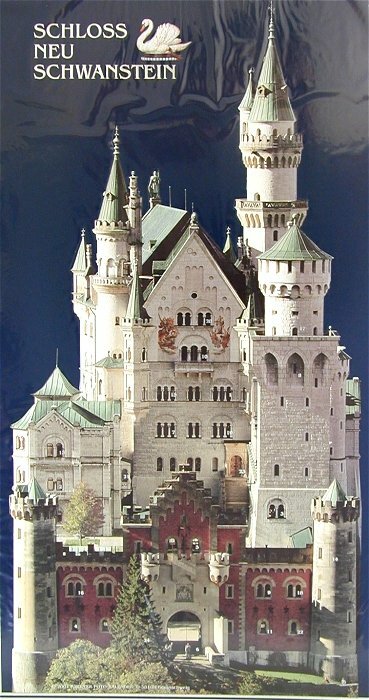 Neuschwanstein, the world famous royal castle near the Bavarian Alps.In 1886 seven weeks after the death of King Ludwig II who had it built for himself , Neuschwanstein was opened to the public. The shy king had built the castle in order to withdraw from public life ironically now vast numbers of people come to view his private refuge. Over a million people a year tour it and you probably recognized it though you may not have know its name. 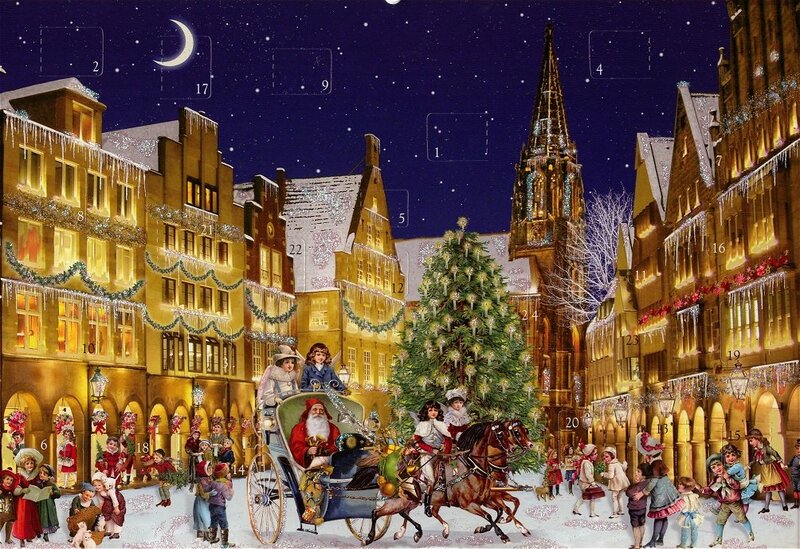 Calendar windows show images of pewter figures and Christmas decorations. 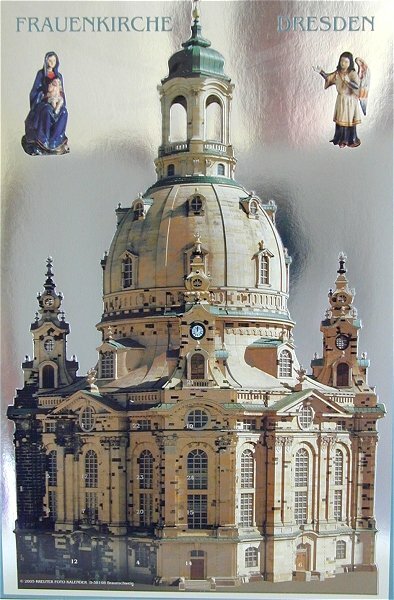 The Dresdener Frauenkirche 'Church of Our Lady' is a Lutheran church in Dresden, Germany, located on the Dresden Neumarkt.The original baroque church was built between 1726 and 1743 and was designed by Dresden's city architect George Bähr. It was destoyed in World War II and was later rebuilt so that the Baroque beauty of it is still there to see today. 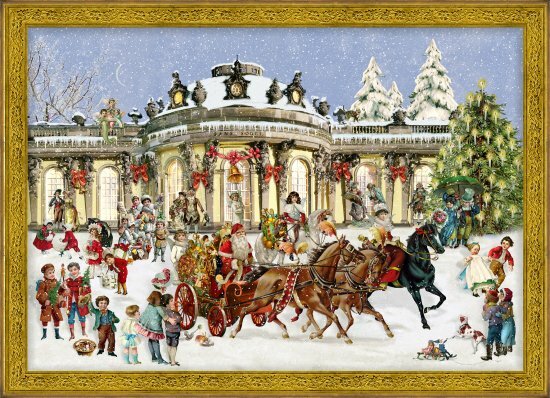 Images in small calendar windows is of baroque sculptures and carved figures. 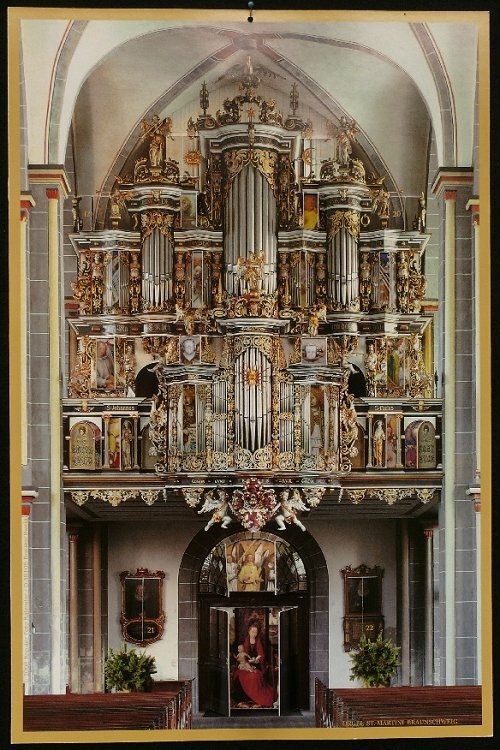 Historic Organ in St. Martinikirche in Braunschweig, Germany. Gothic Hall Chruch,the view is of the western choir loft with main Organ of 1630. Photo shows the calendar with some windows open to reveal the colorful illustrations of angels playing instruments. 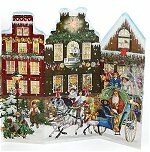 If the canals of Venice are calling you then this advent is just what you need till you can get there in person. You count down to Christmas by taking another ornament from that days pocket and decorating the tree with it.